Your adorable dog Bunnings is just on 7 months old now – what is the hardest thing about being a puppy owner and having a beautify styled home? Our little Bunnings came into our home just as we finished renovations, he was just the size of a tiny potato at first, so it was easy to lose the little guy! One of the biggest challenges was Bunn’s sleeping on our feet as we tried to cook for the first time in our new kitchen, haha but when he got a bit bigger he was able to jump up onto the Malawi armchairs, and we just let him think that he’s king of the castle. We have had a few little mistakes on the rug, but overall potty training has been a pretty easy process! Tim was always concerned about getting a puppy, as he thought they would destroy everything, but he is the easiest, and some would say the cutest dog to have in our lives, luckily for us. What brought you creating the holiday feeling in your home? It would definitely be the location in which our apartment is situated. We live in Manly, so our area already has a relaxed holiday feel about it. We can see the water from our Living / Dining, which helps although our styling has an easy going vibe about it, handmade cuttlefish wall-hangings and coral centrepieces connect our outdoors in. When we go overseas, we are always chasing the sun, so we can have that holiday feeling, although walking through our front door now seems to do that every day. What advice do you have for people wanting to create the holiday feeling at home? Our advice would be to keep it really simple, play with lots of natural materials and textures. 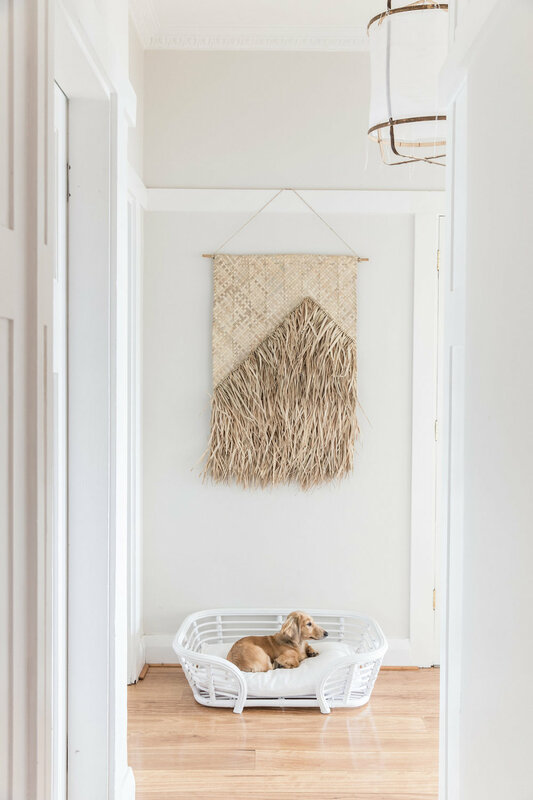 Find those amazing feature pieces you love and let them shine, but don’t stop at one, find a few pieces and let them flow through your home, we choose to highlighted rattan and shades of beige in every space, it just means we get that holiday feeling in every room. 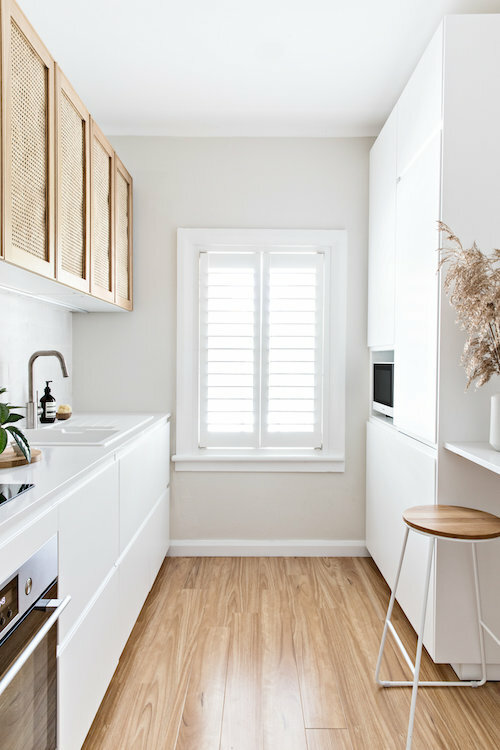 Don’t be afraid of the budget, our kitchen was a flatpack installation, and our rattan came from a local fisherman, we customised our kitchen to continue that holiday atmosphere. Well firstly, back in 2016 when we purchased this apartment, we walked in and were blown away with the amount of character still left inside, original cornice's and deep oversized pictures rails, we immediately knew we didn't want to take away from these features but create a space that incorporates the old with the new. Our minimalistic styling approach comes from our loves of tonal flow, not letting colour or hues distract, so using natural rattan and hand-cut tiles helped emphasise the characteristic of this 1930 build. Even Bunnings had to match our interior ha! And lastly, when you travel - hotels or holiday homes? When we travel its all about getting submerged into someone else's amazing home, you get a real sense of the location and community is in the heart of it all, we love holiday homes but most of all, travel to our Family Villa in Fiji, which is our ultimate holiday home.